The Memorial Union Renovation (MUR) team has minimized the project’s environmental footprint through each phase of the process by staying true to a promise of sustainability. From reusing former Terrace trees as decor to installing an energy-efficient HVAC system, project leaders managed to mix eco-friendliness, preservation and modernization. During MUR, the team has had a goal to preserve and enhance the Memorial Union Terrace tree canopy. In Phase I of the project, alone, 90 new trees and shrubs were planted around the site. The team had hoped to avoid removing any Terrace trees, but found some were showing signs of deterioration. Inside Memorial Union, outdated designs warranted the need for new foundational and decorative pieces to update the interior. The MUR team, dedicated to reducing project waste, creatively and collaboratively found a solution to the issue. They sent the trees removed from the Terrace to The Wood Cycle, a custom woodworking business in Oregon, Wis., to be cut, dried, sanded and finished. Upon completion, the wood was shipped back to Memorial Union to be attached to the walls of the first floor. 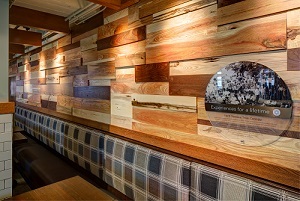 “The wood reclamation was done in part to maintain our core values of reusing and recycling. Just about everything that is associated with the project coincided with those values,” MUR Project Manager Dennis Starrett said. The Wisconsin Union and those behind the Memorial Union Reinvestment value the land and resources upon which the Memorial Union has rested for nearly 90 years. Our team cherishes the opportunity to give Terrace trees new life in a place they will be admired for decades to come.